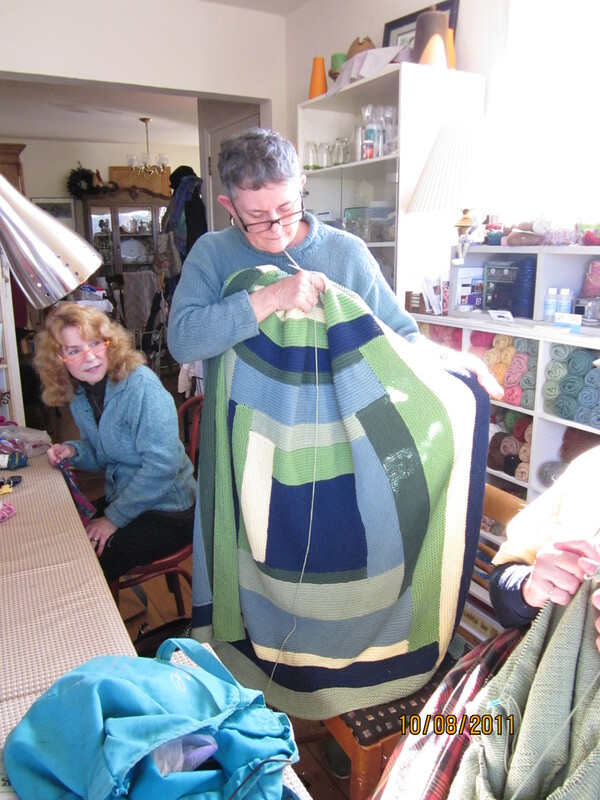 Marsha knits and knits and she recently embarked on another log cabin afghan…similar to the Moderne Blanket but different. This pattern came from May 2011 Creative Knitting magazine. 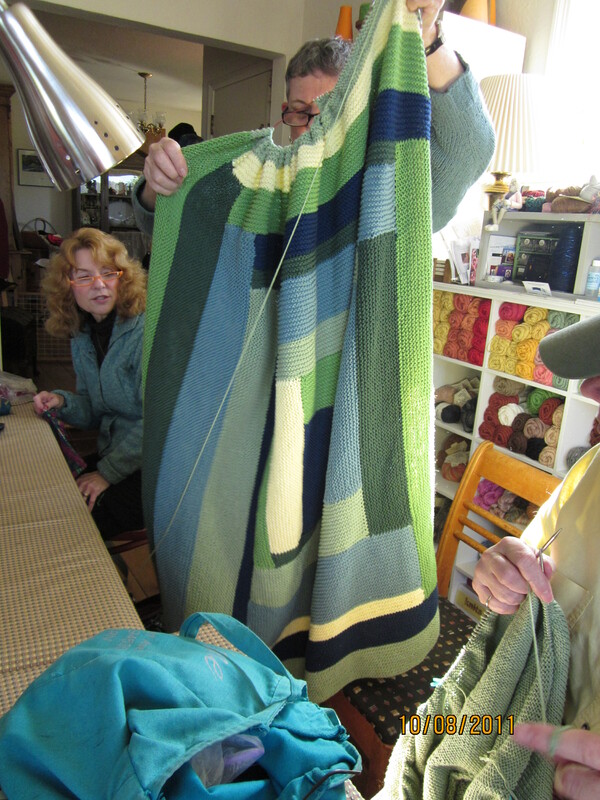 This past Saturday she showed the almost finished afghan….she is now edging with a garter edge. The yarn she chose was once again Brown Sheep’s Cotton Fleece.Here are the six colors that she used….Peridot, Rue, Jungle Green, Lime, Wolverine Blue and Banana. As many of you know this is one of my favorite yarns to knit and it behaves well before and after! My niece has a sweater that I knit for her son…it went through many washings for two sons…and it is now in the family archive. Stay tuned for photo of that sweater to appear. I asked my niece if she still had it….her response…”Of course!” She will send a photo soon and then I will share. I will also share my latest Cotton Fleece creation in the next couple days. 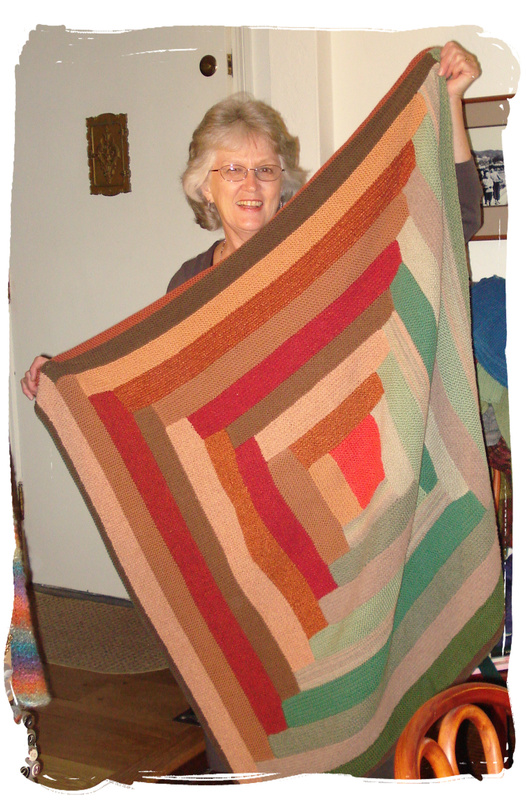 The Moderne Blanket – I loved doing this one for my youngest sister’s youngest baby. There is a beautiful picture of all three of her girls cuddled under this blanket….and I will post that photo later. The Joseph’s Blankie of Many Colors – I started this blanket with my living room in mind…and then I received a lovely gift from my friend celebrating our 50 years of friendship. I’d like to think friends since the womb, thus making me much younger than I am…but it was in grammar school on the Plains of Eastern Colorado that our paths crossed. 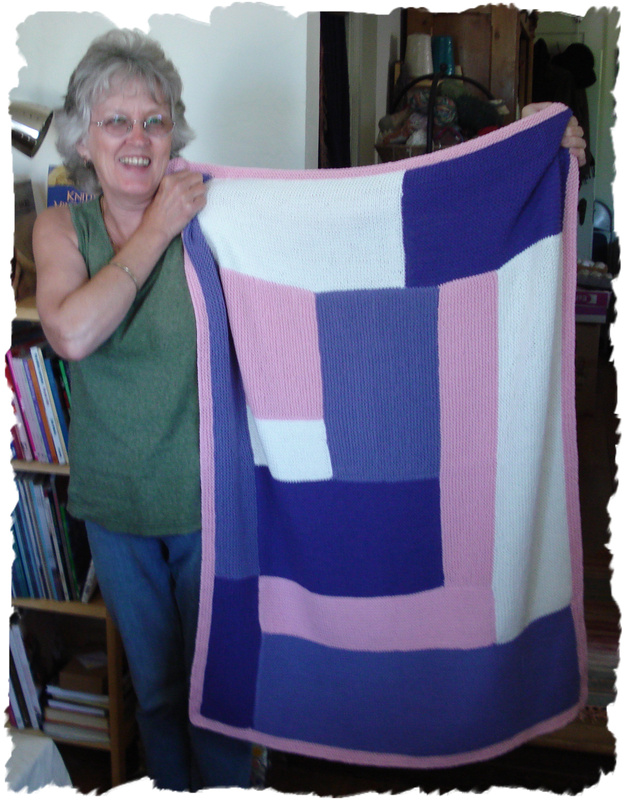 I was so moved by her gift that I thought she should have this log cabin blanket. I pulled it out of its UFO spot, finished it and sent it on. Recently Mary told me that her husband (we all went to high school together) was bragging to some of his co-workers about it…and you know that glaze that sometimes comes over a non-knitter’s eyes…well Charlie experienced it! Sure made my heart happy that Charlie likes the blanket as well as Mary.